Wow that was a busy week with respect to GNSS launches. The week was started by the GPS system launching its 9th block IIF satellite on March 25. It was followed by the second Galileo FOC launch on March 30. There was quite some anxiety about the Galileo launch as the first FOC launch did put the two GALILEO satellites in a wrong orbit due to an issue with the fregat upper stage. The week was completed by a very secretive BeiDou launch by the Chinese. The GPS launch is basically just a continuation of the IIF launches and from that point of view nothing new. But of course very important to keep the GPS constellation alive and kicking. The Galileo and BeiDou launch are certainly more interesting. For Galileo although being the second FOC launch it is actually the first as the initial launch resulted in the satellites ending up in the wrong orbits. And although the orbits have been adjusted they are still very far from nominal. So these will be the first Galileo FOC satellites in their nominal orbit. The BeiDou satellite, although very little is known about it, seems to be the first satellite of what is called the phase III in the BeiDou programme. This means that the signals of this satellite will be completely different from the previously launched BeiDou satellites. For both the B1 and B2 signals the frequency is now slightly different, i.e., bringing B1 to the same frequency as used by the GPS L1 signals and the Galileo E1 signals. The change of the B2 signal frequency makes it use the identical frequency as the Galileo E5 signal. The GPS IIF already started to transmit its first signals and will be included in the products of the International GNSS Service very soon. When the first signals of the other two satellites may be expected is unclear. But if they come they will be much more exiting! I am at least very much looking forward to them! Purely out of interest I have made a plot of the ground track of the orbits in which the last two Galileo Satellites ended up in. The results is shown in the figure below. The figures shows the ground track of Galileo-101 (E11), one of the older Galileo satellites, and Galileo-201, one of the two new Galileo satellites, over a period of 24 hours for August 23, 2014. A couple of interesting features can be seen from the plot. Firstly the difference in inclination, 56 vs 49 degrees, is clearly visible as the maximum latitude of the Galileo-201 satellite is clearly smaller. Secondly, the orbital revolution period is clearly significantly shorter. The normal Galileo satellites have an orbital period of around 13 hours. This means that in 24 hours, the period used for the plot, they will complete less then two orbital revolutions. The new satellite clearly completes two full revolutions within the 24 hour interval. This nicely shows that the new two satellites will not fit into the Galileo constellation in their current orbit. They will move through the constellation in a very wild way. What I find a bit scary is that with the Perigee of these orbits at merely 20000 km these three objects, the two Galileo satellites and the Fregat, are actually moving through the orbital planes of the GPS and GLONASS constellations. This means to sooner or later they will be on a "collision" course with one of those satellites. Fortunately the satellites seems to be in good order so they can be steered but not sure about the Fregat. So GPS and GLONASS may have to do collision avoidance manoeuvres because of this mishap. But not all is bad. GNSS scientist have actually concluded a couple of times that different orbits for the different GNSS satellites would be advantegeous for their high accuracy investigations. So at least some of the GNSS scientist might be happy with this situation! It seems that the Galileo satellites, numbers 5 and 6, launched yesterday (August 22, 2014) have not reached their intended orbit. The intended orbit would have had an altitude of around 23'000 km whereas it is said that the lowest point of the achieved orbit is only 13'000 km, i.e. 10'000 km below the intended orbit. Also the intended inclination of the orbit was not reached with 47 deg versus the planned 55 degrees. The launch seemed to go picture perfect, I watched it life at the European Space Operations Centre in Darmstadt, Germany. So my guess is that the Fregat upper stage did not perform as expected. I think that the 10'000 km altitude may be corrected but the inclination error may be harder to correct. I would have to do some calcuations but if I remember correctly an inclination manoeuvre is more "expensive" (in terms of fuel consumption) than the altitude correction. So I fear that these satellites are more or less "lost" in terms of being part of the final Galileo constellation. But, as these are brand new satellites, they will serve a very much needed purpose of testing and validating these new birds! So not all is lost. In any case this is unfortunately an other big blow for the Galileo project. But this is basically just a small technical "hick-up" which does happen in the Space Industry. I am sure the Galileo project will survive this and continue on the path it has set out of brining us a very much needed European Satellite Navigation System. For more information here some of the links on this topic (but they do not have too much information yet). Small add-on. Just looked up the TLE (two line elements) from NORAD (celestrak) and computed the orbits myself. Based on the last set of TLE's the semi-major axis is 26'196 km, the eccentricity 0.23, and the inclination 49.76 degrees. This gives a Perigee (closest distance from Earth) of 20'170 km which is indeed about 10'000 km too low. But it would also mean that the Apogee (furthest distance from Earth) is around 32'000 km. That would be about 3'000 km too much. So seems that the Fregat had enough power but the orbit injection was miscalculated and/or misfired... Not good! 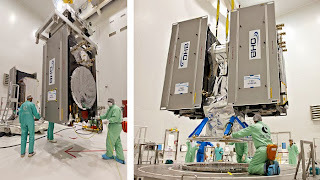 The first two GALILEO In Orbit Validation (IOV) satellites have been launched successfully from the European Space Port in Kourou, French Guyana, on Friday October 21, 2011. This launch was a double success as besides being the very first true GALILEO launch it was also the first launch of a Soyuz rocket from Kourou. Despite all these "firsts", which is always a bit exciting in the aerospace industry, everything worked picture prefect. The satellites were injected into the planned orbits. The satellite are now in what is called the Launch and Early Orbit Phase (LEOP). Currently the satellites are slowly drifting towards their orbital positions and therefore also drifting apart. To get their relative positions correct the two satellites will have to be separated by 40 degrees in their argument of latitude. This will take a couple of days of "drifting" to accomplish. After this drifting phase both satellites will make a number of small manoeuvres to get into their nominal orbit position with very high accuracy. Once in their nominal orbits the GALILEO satellites are expected to need at most one station keeping manoeuvre in their nominal life time of 20 years. At long last Europe has become one of the players in the GNSS field! Personally I am very much looking forward to working with the first observational data of these brand new satellites which mark a new era for the GNSS industry. 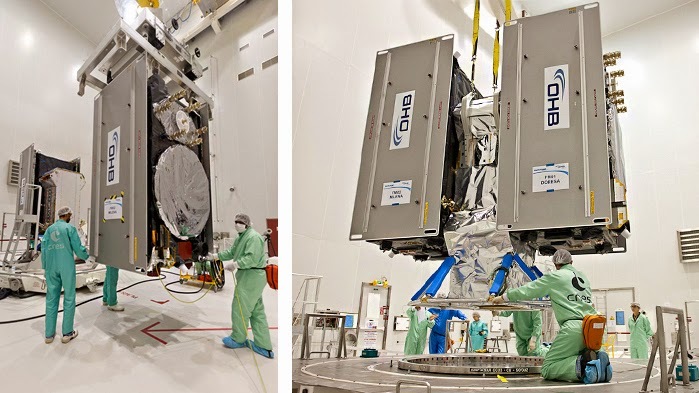 The GALILEO IOV launch has been delayed by 24 hours. No information on the cause if this delay. Will keep you posted! At long last the launch of the first two real GALILEO satellites is near. This Thursday, October 20, 2011, the first real GALILEO satellites will be launched. This phase of the GALILEO developments is called the "IOV" phase which stands for "In Orbit Validation". An interesting feature of this launch is that although it is from Kourou it is not with an Arianne launcher. The launch is with a Soyuz rocket and this is actually the very first Soyuz launch from Kourou. So a number of firsts are coming together, so lets keep our fingers crossed that all goes smooth! For detailed information please look at the ESA web-site. Many people ask why do we need any other GNSS system in addition to GPS. This question is asked especially in view of the European Galileo related developments but also when looking at the Russian efforts of rebuilding the GLONASS constellation. Well “need” may be too big a word but there are very significant benefits of using more than one system. For high accuracy applications, which are our primary focus, there is a significant accuracy benefit. This benefit is especially visible and important in real time usage. The additional satellites of another GNSS do improve the real-time position estimates dramatically. To explain this we have done a simple experiment. We have taken a static station, a station that does not move, but estimated the position for each 30 second epoch over a 24 hour period. The repeatability of the epoch estimates gives us a very good measure for the precision of the epoch estimates. Since the station does not move the estimates should be the same for each epoch, well at least if our model for the Earth tides and such is accurate. To show the effect of GPS versus GNSS we selected a station that does track both the GPS and the GLONASS satellites. Thus we could generate 3 solutions, a GLONASS-only solution, a GPS-only solution, and a GNSS solution (GPS + GLONASS). The results are given in the bar plot below where the red bars represent the GLONASS solution, green the GPS solution, and blue the GNSS solution. 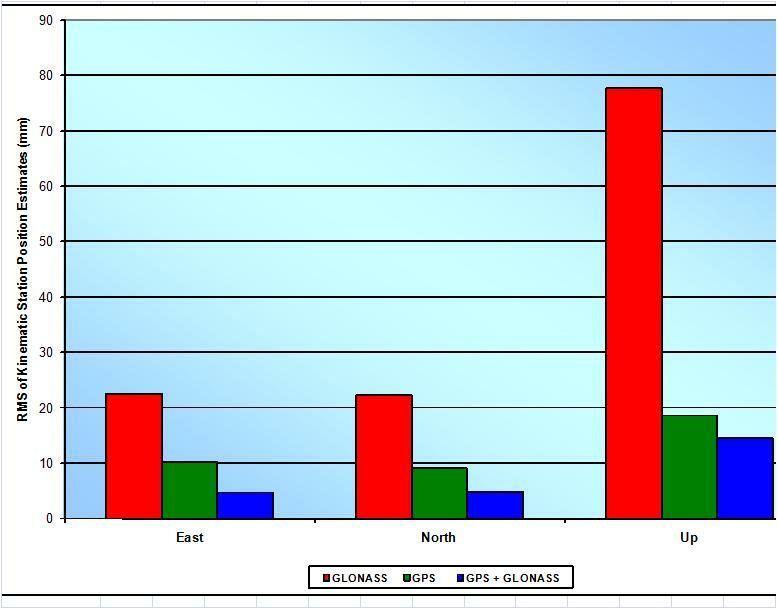 And we distinguished between the East, North and Up component as Up is typically the worst component. 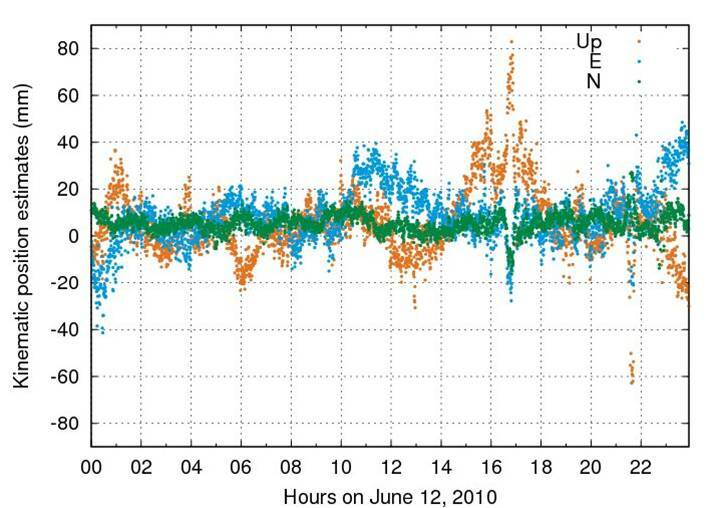 The bar plot nicely demonstrates that the GNSS solution (blue) is significantly better then the GPS solution (green), in the East and North directions almost by a factor of two. This is despite the fact that the GLONASS only solution (red) does not perform very well. The quality of the kinematic GNSS position estimates is astonishing with repeatability’s of 5 mm for the horizontal and 15 mm for the vertical components. 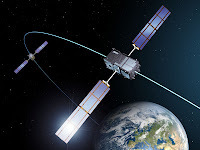 The relatively poor performance of the GLONASS solution is caused by the fact that the GLONASS constellation is not complete. Does during the 24 hour period we used for this experiment there is a period where there are less than 4 satellites in view, this severely impacts the quality of the GLONASS only solution but has no negative effect at all on the GNSS solution. This highlights another benefit of GNSS solutions; the larger number of satellites leads to much more reliable and robust estimates. This explains the main reason why especially surveyors and the offshore industry are fully “addicted” to GNSS. Besides being better it is much more robust and reliable. Last but not least the picture above shows the 30 second position estimates of the GNSS solution. A repeatability of 5 mm for the horizontal and 15 mm for the vertical components for fully kinematic position estimates is quite impressive, is it not!? So regarding the question "to GPS or to GNSS" the answer is a clear GNSS.